Protein, it is an important part of our daily diet now, but will become even more vital during a long-term disaster. Our bodies require more protein for energy during high-stress situations, and a SHTF scenario will definitely be one of those situations. On a daily, really an hourly, basis, we will be engaging in far more strenuous physical labor than we do now, which will cause our bodies to burn more calories and require extensively more protein to remain strong and healthy. 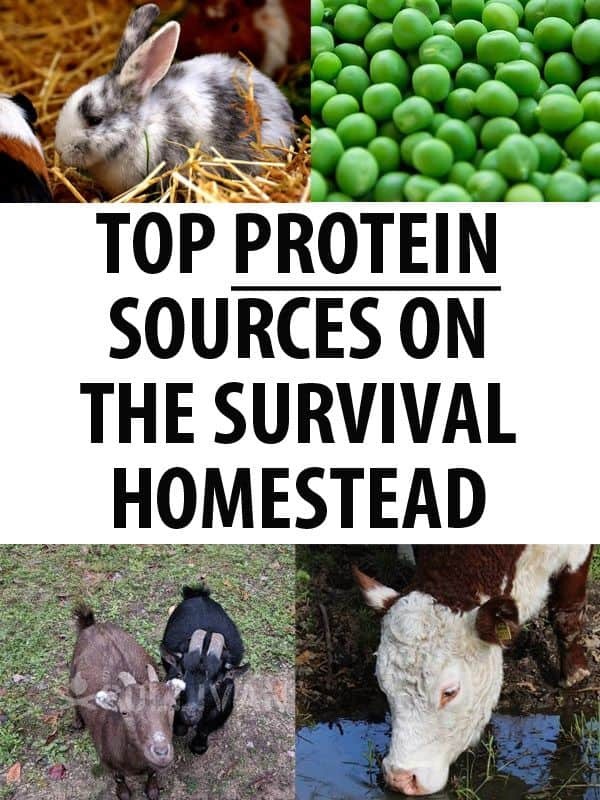 There are two very specific types of protein you can raise or cultivate on a survival homestead. While animal based protein offers the most robust source of the vital nutrient, plant-based protein sources should not be neglected when creating your sustainable food source plan. Regardless of how small your growing and pasture / backyard space may be, you can grow and raise your own protein sources. The dried waste from livestock makes excellent composting material, and will generate rich dirt to use when growing plant based sources of protein and other garden crops. Cows are a perfect to raise during a survival situation for several reasons, but there are some substantially notable drawbacks to raising bovine, as well. Pros – Cows are sources of both of meat and dairy. Beef harvested from a single cow could provide enough beef and protein for a family of four for an entire winter – perhaps beyond. Cons – Cows require a lot of pasture space, and must be fed a substantial amount of hay to survive over the winter months. 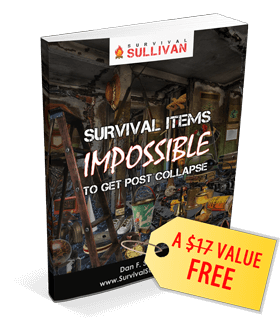 During a long-term SHTF disaster, you will not likely be able to buy hay, and will only be able to harvest enough on your own if you have significant and stable fuel stockpiles or hay raking, cutting, and baling equipment that can be pulled by horses – which also need hay to eat during the winter months. Summary – If you do not live in a climate that allows a pasture to grow year round or have enough land and suitable equipment to bale your own hay, keeping cattle will only be able to supply protein for the family for a short time, then butchering and preservation of the beef off-grid style, will be necessary. Miniature cattle could provide a workable solution, the protein yield would be lower, but so would the space and amount of hay required to keep them alive. 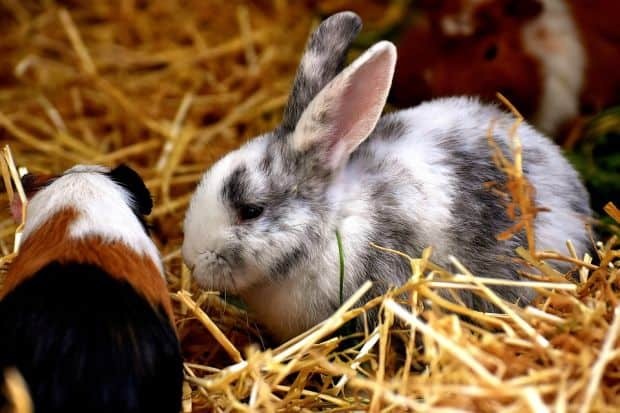 Pros – Unlike cattle, rabbits take up very little space to keep, can survive on sprouts grown indoors and then delivered to their hutches to eat over the winter months, and reproduce extremely quickly. Cons – Rabbits are small livestock and therefore will not provide as much protein per animal as large livestock like cattle or even medium livestock. Summary – Build a rabbit pen that allows the small livestock access to the grass so they can dine naturally without costing you a dime. You can use a “chicken tractor” to rotate the grazing area so the food supply runs out at a far lower pace and helps to keep weeds down and snakes at a distance when you no longer have the extra gas or time to mow the property. Rabbits reproduce not only amply, but quickly, so there is no need to wait six to nine months before butchering or up to two years for large livestock like a cow. Goats do not need a quality pasture or even semi-level pasture to seek out food for themselves. A free-ranging goat could feed itself all winter long by traversing rugged terrain and eating the leavings from on the forest floor. 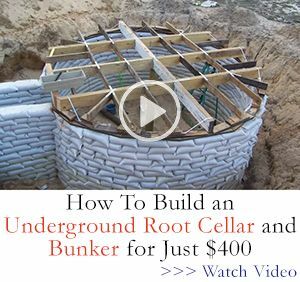 If you cannot free-range your goats, simply tie them to a cinder block or similar object in different areas on the survival homestead and allow them to browse for food. Pros – Goats, like cattle, can provide both meat (protein) and dairy. While some breeds are known as better for meat production and others for milking, any goat (or cow) can be used for both. Goats take up a lot less space and eat far less than cows, but still produce a fine quality and non-fatty meat. 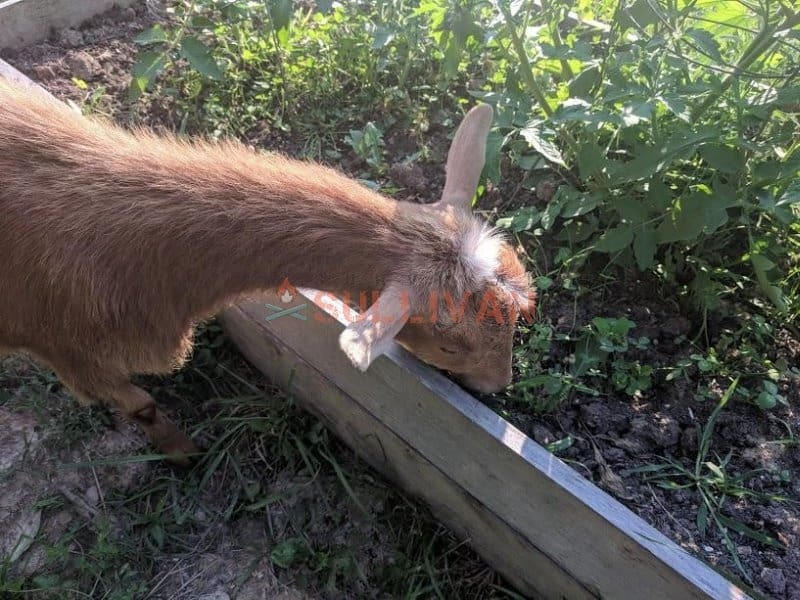 Goats do not need a true pasture to feed, they will eat brush, weeds, leaves (growing or dead ones from the ground) and basically keep the undergrowth back away from your pasture and home. Cons – Goats, being medium livestock, will not produce as much meat as a cow. Summary – Goats typically produce two, sometimes three kids, per litter (after giving birth the first time) and can usually reproduce twice per year. They will browse for their own food, making them cheaper to feed and needing far less hay, even during winter, because in most environments, there is still enough vegetation for them to eat. Pygmy and Nigerian Dwarf goats could even be kept in a suburban backyard (if local laws allow) and on small survival retreats. This Pygmy and Nigerian Dwarf goat cross could live quite contentedly in a backyard or on a small 5-acre survival retreat. Pygmy goats are known as meat goats and Nigerian Dwarfs are a quality dairy goat breed. Pros – Chickens, ducks, and turkeys are another form of livestock that will provide you with not only meat to cook but will lay eggs basically year around, providing your family with yet another source of protein. Very little space is needed to keep chickens. If the chickens, turkeys, and ducks are allowed to free range or have access to a portable tractor cage, they will not need commercial feed during all but the winter months. Like rabbits, chickens can eat sprouts and small patches of clover grown indoors during the cold months to help supplement their diet. Ducks will also live off of tadpoles and small fish found inside your pond or creek. If the ducks are caged, simply provide a baby pool or dig a small garden pond to give them continual access to the water. Cons – Ducks and chickens are small, and therefore will not provide as much protein as larger livestock. Summary – Chickens and ducks are inexpensive to buy and keep. If some of their eggs are allowed to hatch, you can cultivate a larger flock to produce more meat and eggs during a long-term disaster. It takes only about four months for a chicken to reach a nearly mature weight and to begin laying eggs, depending on the breed. This might not be the prettiest chicken coop in the world, but I can guarantee you it is one of the safest. The chicken wire around the run is reinforced with small gauge hardware cloth at the bottom, and also lines a trench that was dug at least one foot around the perimeter of the run. The coop itself is also reinforced with both hardware cloth and metal roofing. Pros – Sheep do not need quality pasture in order to garner the food they need to survive. Proper pasture rotation is necessary to ensure sheep placed in a field with cattle or horses do not eat the grass down to the root and cause vast delays in new growth. Cons – Sheep of almost all varieties must be sheared, or the weight and heat generated by the wool will be too heavy for them to carry and cause heat stroke. If shearing manually is not something you will be equipped to do on your own, spend the extra money and time to find a heritage breed of sheep designed to live in a hot climate, and rarely ever need human intervention to deal with wool shedding. Pros – Hogs are large livestock that require very little space to live and, like goats, do not require quality pasture to fulfill their dietary needs. The scraps from nearly everything you eat, which can be tossed into the hog pen to put extra fat on the animals. Cons – Hogs are the only animals I would suggest to never permit to free range (though they both need and deserve a pen built with humane dimensions in mind). If the hogs are permitted to roam free, they tend to lose an extensively larger portion of their body fat that other forms of livestock – meaning you will be harvesting far less protein from the animal you have invested your time and money in raising. Proper fencing materials will require a monetary investment as well as frequent checking and repair. Hogs are especially strong animals, and cannot be housed inside a pen with panels made solely of wood or barbed wire – they are also expert burrowers. Summary – Although they grow to be large livestock that provides ample meat, when purchased as “weaners” – hogs that have just been weaned from their mothers, the young animals generally cost only around $40 each. Pros – Stocking a pond with fish is a fairly simple way to create a sustainable source of protein on a survival homestead. Cultivating an aquaculture operation, or fish farm, will take more of a time and money investment than simply buying fish to put in your pond, but can well be worth the effort when protein comes in short supply after the food chain breaks down during an apocalyptic event. Cons – Diseases spread among contained fish just as easily as they can throughout a barnyard pen. Learning how to monitor water quality to ensure the longevity of the fish and how to determine if a fish is healthy enough to eat, are skills you must master now, before the SHTF. Summary – Fish is an easy to preserve protein source. It can be dehydrated, canned, or smoked. If stock a pond with fish, you will also soon likely attract frogs and turtles, which are also a great (and free) source of protein. Fishing in waterways near your survival homestead should also be worked into your sustainable food source plan. 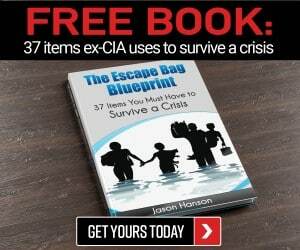 Natural resources will decrease quickly as their populations are overly stressed by the sudden demand placed upon them, so relying solely on what you can fish, hunt, or trap, would almost certainly lead to starvation, no matter how much land you owned or your prepper retreat sat adjacent to. Hunting and/or trapping wild animals native to your area is yet another solid way to enhance the amount of available protein for your family. Hunting and trapping, even on your own land, should never be conducted alone due to the increased level of danger that will be present. Do not expect any survivors to respect property boundaries, seasonal hunting laws, or land limits during a long-term disaster. You must check your traps frequently to avoid your catch being snagged by someone else. Always hunt with a buddy to help ensure you will not be shot for the deer that you spent all day tracking, and are now carrying over your shoulders and back to your loved ones. Raccoons like the ones that left the tracks at a watering hole by the creek on our property, will kill your protein poultry flocks and eat their eggs. They can also quickly destroy even a large garden plot. Peas – This little green garden goodie boasts perhaps the highest source of protein in the vegetable family. Corn – Whether you eat if fresh off the cob, from a Mason jar that has been dehydrated or canned, you’re still shoveling a quality source of protein onto your plate. Spinach – This green veggie has long been regarded as a super-food. Not only is it packed with highly beneficial antioxidants, minerals, and vitamins, it is possesses a splendidly high source of protein. Broccoli – Not only is broccoli high in vitamins, minerals, and fiber, it also a protein rich vegetable. Kale – Once again, a green member of the vegetable family is credited with being a significantly high protein producer. Mushrooms – If you live on a large survival homestead or in an area surrounded by woods, go foraging for your protein. Many mushrooms are high in protein, but learn how to identify the poisonous from the edible and make a field guide to reference while you are hunting for them in the woods and cross-training other members of your family to do the same. The maitake and reishi varieties are among the best to forage when seeking to add some more protein to your diet. Artichokes – When you go green, you just simply cannot go wrong with it in your garden. Asparagus is both filling and offers a significant source of fiber, in addition to protein. Brussel Sprouts – As a child, you might have tried to hide the brussel sprouts under your plate to avoid being forced to eat them, but get over that finicky part of your nature and start growing some of these little gems right away. Brussel sprouts are nearly equally high in both fiber and protein. Growing and raising your own groceries takes a lot of time, money, and effort. You must not only raise and preserve your own protein in preparation for a long-term disaster, you must protect it as well. Growing a bountiful garden and having a barnyard fully stocked with animals will not prevent your family from starving if predators – both the kind of four legs and two – steal it before you get a chance to eat it. Even if you live in a suburban area and plan on riding out the apocalypse there, do not fool yourself into thinking wild animals will not be encroaching upon your garden plots, rabbit hutches, and chicken coops. Around our garden plots we have strung chicken wire, covered by high-tensile wire that is also used for the hog pen, and then a layer or bird netting. All three layers are tied firmly together to help prevent rabbits and deer from getting inside the garden. Several lines of baling twine are strung at the top of the post with pop cans (soda, for you folks that are not from Ohio) aluminum pie pans, and other shiny noise makers. To further deter entry to out protein sources and other crops, we weighted down the tightly strung layers of fencing with logs, rocks, and bricks. When our budget will allow it, we’ll also trench some hardware cloth around the growing plots just like we did the chicken coop in an effort to further curtail burrowing predators from getting inside and eating their fill of our food. The strain placed upon natural resources by human will push the wild predators out of their traditional boundaries in search of both safety and food. The investment you make in fortifying your livestock areas and garden will undoubtedly help ensure the crops and livestock intended to for human consumption, will indeed be used to feed your family. Thank you for a very informative article. We presently live on 5 acres and raise a few chickens for both eggs and meat. I would consider adding a few small goats and/or rabbits if things really started going bad. Also note that pigs are escape artists and can be real dangerous in the pen especially females with a litter. The old stories about farmers being eaten by the hogs were true. And that cattle can be dangerous as well. I have worked with cows that were very protective of there young as well. To bread cattle you will need to keep a bull many framers were killed by milk cattle bulls.